Well that’s how I felt when I discovered Charlotte Mason‘s Copywork. Although her approach seems deceptively simple, it is power-packed with skills and range of difficulty that will teach, reinforce, strengthen and develop your child’s handwriting, spelling, vocabulary, grammar and writing style, all the way from Grade 1 to high school graduation! Gently moving from one stage to the next as the child is ready, the child will very naturally learn beautiful handwriting, develop grammar and improve spelling, increase vocabulary, and seamlessly imitate good writing style. Once a child has learnt to write each letter using my laminated handwriting charts, beginners begin to copy each sentence, done slowly and gently, with an emphasis on quality not quantity. 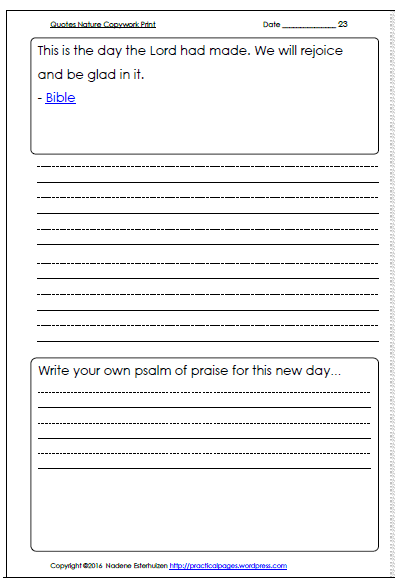 Careful copywork gives a child the opportunity to practice beautiful handwriting in context. Copywork reinforces the habits of observation, best effort, and attention. Lessons are kept short (5–10 minutes) and the goal is beautiful work. Once the student has mastered the mechanics of handwriting, he can start concentrating on the spelling of the passages he is copying. At this stage he looks at/ studies the word in the passage, then writes it from memory, and double checking his spelling right away. Rather than copying letter for letter, he begins to write whole words from memory, working his way through the passage. The child studies the passage ahead of time making sure he knows how to spell every word in it, taking note of the punctuation and capitalization. Parents dictate the passage phrase by phrase. Dictation cultivates the habit of looking at how words are spelled, reinforces correct punctuation and capitalization; sharpens listening comprehension; increases vocabulary through context; reinforces correct sentence structure; reinforces the habits of observation and attention. 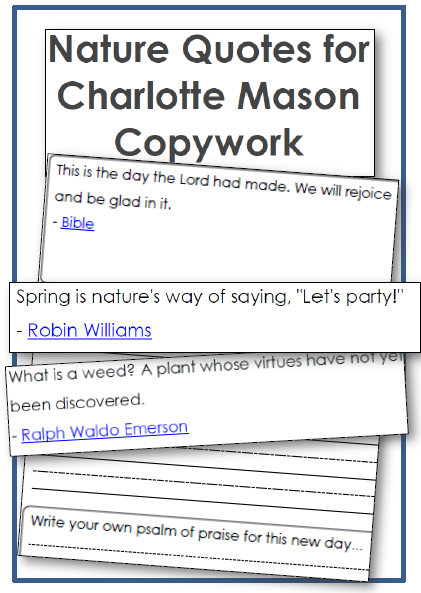 I have created a series of copywork pages, and updated my popular Nature Quotes with both print and cursive options. The print version has new, considerably shorter and easier quotes. These pages also include creative writing or interpretive writing prompts, offering you a power-packed application if you follow Ms Mason’s 3 methods. 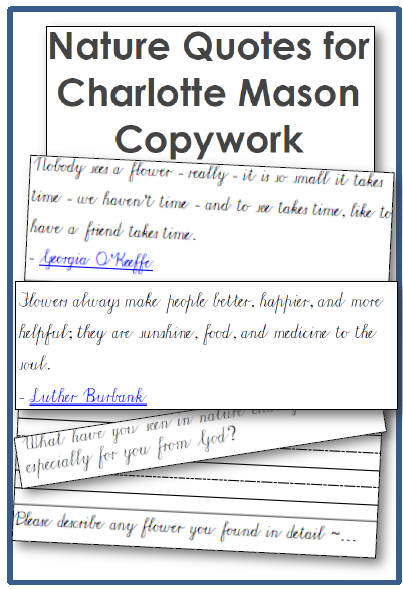 Pop over to my Copywork Pages for all my other free downloads. I love Charlotte Mason’s simple, yet highly effective approach!